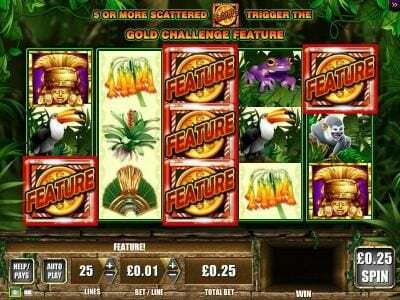 Riches of the Amazon online slot machine pictures and slot feature list from WMS, play Riches of the Amazon Slots for free. 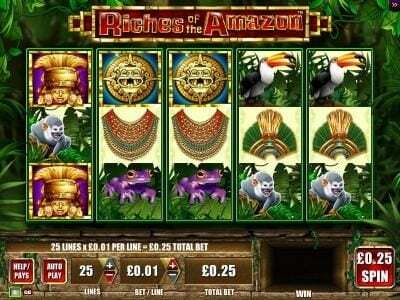 Riches of the Amazon Slots has not been reviewed yet, be the first to rate this slot. Riches of Amazon, a 5 reel game with 25 paylines, was designed by those at wms. 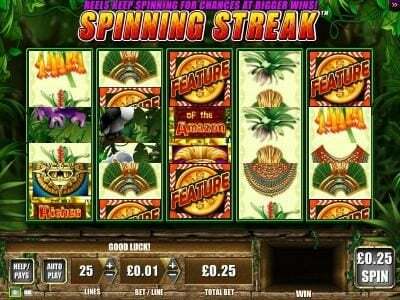 This slot offers a top payout that goes up to $25,000 with the features being scatter symbols, Free Spins and wilds. 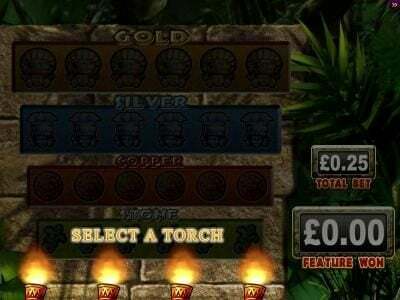 The Amazon jungle is the one that the action in this slot focuses, with the symbols used being either the animals and various other creatures and plants found there or the elements related to the civilizations that managed to tame the area at least partially. 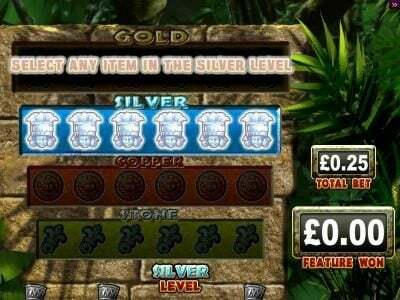 It’s a pleasant looking design, with the jungle being visible in the background image, while on the reels you will find quite a few symbols which are themed around the game’s topic. Since it’s a theme that involves the riches of the Amazon, there are quite a few symbols which have items made out of gold, things left behind by the Mayans and the other civilizations that inhabited the area in the past. The symbols include the logo of the Slot, the Feature gold coin, two gold idols, monkeys, parrots, butterflies, flowers, pottery and a necklace. The game has 25 paylines that have to be selected at all times. One coin is used for each line, with 25 coins being the standard bet. The coin denomination is the one that can be changed, with the $0.01 value being the starting point while $5 is the higher value. Bets go up to $125 as a result, with payouts being up to $25,000. You might expect a regular combination to be the one to award the top jackpot, but it is not the case here. Instead, the game offers this payout as a result of 11+ scatter symbols being present at the same time. When that happens, the payout is 200 times the wager. The scatter symbol in question is the gold coin marked Feature, and it will give the player access to the bonus round starting from 5+ scatter symbols, while payouts are offered from 7+ symbols. The Bonus round of the game is called Gold Challenge. The other major feature of the game is the wild symbol which can substitute for the other symbols available, as long as they are not Feature symbols. This wild can appear on the reels 1, 3 and 5. Overall, it’s a decent game with high quality graphics and some interesting features. It’s not going to truly impress you, but it will do just fine for a few hours.